Mixed pack of geometric butterflies. 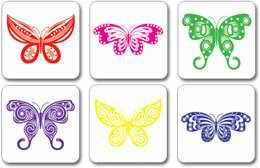 The Geometric Butterflies come in a mixed pack of 7 colors: Red, Orange, Purple, Yellow, Blue, Fucshia, Lime Green. 250 caps per pack.